Following the recent clock change and the evenings becoming darker earlier, officers from the Castle Cary Neighbourhood Beat Team have been out promoting winter road safety with local children. Dark evenings and unlit roads, particularly in unlit villages, are contributing factors towards road related accidents at this time of the year. 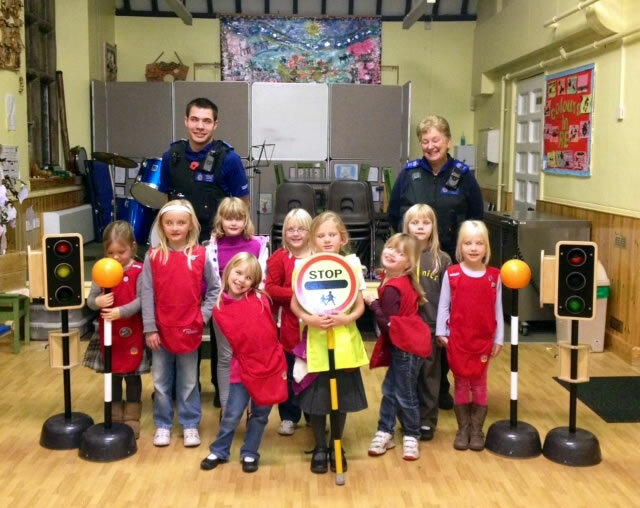 Utilising high visibility jackets and a variety of wooden props designed as pedestrian crossings, Police Community Support Officers Dan Arthur and Thelma Mead last week attended at the weekly meeting of the 1st Galhampton Rainbows at North Cadbury Primary School. PCSO Dan Arthur said: "My colleague and I attended to deliver a learning package aimed at promoting winter road safety. The well-behaved class of 5-7 year olds responded well to our lesson and actively got involved with utilising our mock wooden pedestrian crossings and road signs. I hope that raising the awareness of road safety will benefit the safety of all road users at this time of year. "Your kids will copy you, so parents, remember to set a good example of road safety. Hi-Visibility jackets are inexpensive and enable drivers to see you clearly in dark or poor light." The beat team are hoping to run similar lessons throughout the winter period to remind both parents and children to be safe and seen on dark unlit roads. If you would like your local beat team to attend your child's school or youth event please contact the non-emergency contact number 101.